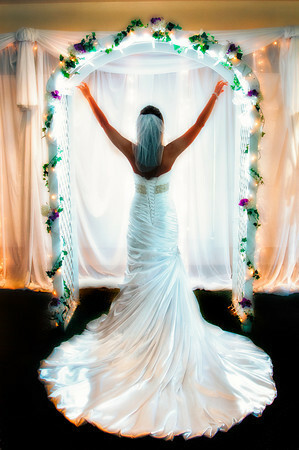 One of my favorite Bridal Poses is this type of shot (Angel Pose). I use many variations of this pose, utilizing different lighting techniques, and lighting combinations. If the bride has a large veil, then I will have her hold the veil with her hands creating a distinctive look. There are many different variations of this pose that I use depending on the setting or bride's gown. My first goal is to find either a doorway, arch, or something similar to frame the bride. In this case, I utilized the glowing archway by the professional decorating company A Rent and Event Company. The archway and window covers enabled me to create a very unique and stunning look. My second shooter was standing to my right holding a strobe on a light pole, with it facing the front of the bride. I used a second light, camera left, and a reflector camera right. When there is a doorway that leads outside or into a well lit area, then I will pose the bride in the doorway utilizing the outside light to create the glow on and around her. If the wedding is outdoors or there is an archway that faces the sun, I will pose the bride in the archway, utilizing the natural light to create the glow. Before and during the wedding, I look for areas that would create a beautiful area accenting the brides beauty and character. Typically, I will use either a black & white look or a glowing color look in the album or print. However, in this case, both the color and black & white image presents a very unique and creative look. 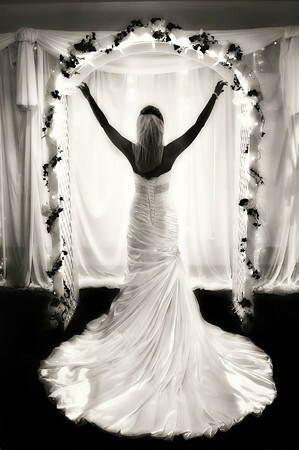 I plan to display one of these images at the upcoming Bridal Expo at the Fez in Hopewell Twp. The show is scheduled as a one day bridal/wedding show for Sunday, January 8, 2012. For more information, click on this link.